France, a country known for its romantic atmosphere, its extended history and widespread culture, is not really a place where you expect this kind of desert-grunge to be coming from. Yet, we've been more than pleasantly surprised by the musical export products of this huge country in the past and this time that's not different. The Coyotes Dessert, founded by former members of Caedes, bring something completely new and unexpected to our stereos, yet it sounds so familiar and vintage at the same time. 'The Wedding' is the band's first full length, after an e.p. earlier this year. Personally, I've never heard Caedes music before but frankly, I don't think it can be as good as what The Coyotes Dessert has produced here. The experiences the members had with previous bands and projects, make this album extremely enjoyable, even if it's a style of music I rarely pay a lot of attention to. This time however, I'm tapping my feet and shaking my head to the uplifting heavy rock. It's striking and amusing how The Coyotes Dessert succeeds in creating a perfect blend of nineties grunge, alternative rock and desert blues and even incorporates some country music references. All these influences make 'The Wedding' sound like an overview of a rock festival that is well worth buying a ticket for. With heavy guitars, tempo-changes, a weird sense of humour and excellent vocals this album surely brings a smile on my face. Of the fourteen tracks on this album, none really sound alike. There's a lot of variation, even in the vocal part. That vocal part goes a little offbeat in the almost industrial punk song 'Devil Dance', a track that starts off as a Ministry track, quickly turns into something Nirvana could have written, only to finish sounding like Alice In Chains. But it really doesn't stop there. Where most Nirvana songs were all about making as much noise as possible, The Coyotes Dessert puts a lot of songwriting experience into the whole, making it a lot better. On other songs, The Pixies, Dinosaur Jr or Queens of the Stone Age seem to shine through, along with some surf and americana stuff. These references float in and out of the songs and more of them appear after a few listens (even all the way up to Type O Negative). Yet they are not prominent enough to create a 'heard-it-all-before' feeling. Instead there's a huge sense of originality into the music. 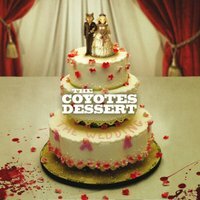 The Coyote Dessert seems to know perfectly well how to blend all of those influences into their own sound. For some reason it all sounds pretty American although this album has a lot more variation than most rock bands coming from that continent.